School Camps / School Groups. Environmental Awareness / Cultural Education / Life Experiences. Russell understands the value of school camps and extended excursions for the child's development and growth as students progress through the school years. Having been a teacher of Primary, Secondary and Tertiary Education in numerous locations around Australia and Internationally over a fifteen year career, he has seen many changes in the delivery of education. "The need for students to experience the wilderness along with the opportunity to stretch themselves out of their comfort zone has never been greater than now. What a magnificent and rare opportunity Outback Australian Camels offers. Discovering nature as it was intended, getting away from the clutter of modern life, being away from multi-media influences and bonding with animals through quality, professionally crafted, Outdoor Educational Programs. 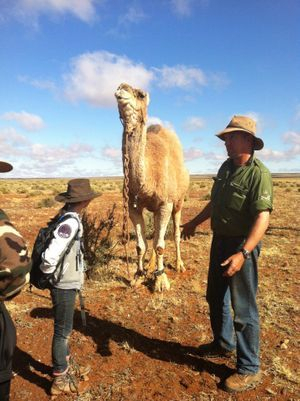 Outback Australian Camels will tailor a program to suit your schools and students needs, meet curriculum aims and objectives, create programs for specialist subject disciplines and design programs for lead up activities as well as follow up classroom materials and activities. * Completed an imaginative short story for publication. * Completed a short Science Report of their own choice but related to the natural environment of the region. * Completed a letter of request to an environmental agency for protection of our natural resources. * Participated in activities involving angles and Navigation. * Been invlved in map reading activities and daily distance walked calculations. * Completed a data recording record of the types of flora and fauna discovered whilst travelling. * Been involved and actively participated in trekking a designated number of kilometers cross country per day. * Partaken in a morning and evening stretch routine. * Learnt the process of saddling camels, loading camels and unsaddling, unloading camels. * Investigated ways of navigation using natural science. * Participated in physics using water balancing as a tool to investigate pressure. * Discovered Aboriginal occupation sights and discovered uses of traditional tools. * Studied the interrationships between soil, plant and anmals of the region. * Examined the geograpghy of the Northern Flinders Ranges and the sand dune country adjacent to the Flinders Ranges. * Examined Human Impacts to the Natural Environment of the region. * Participated in a variety of art related activities. * Investigated the Geographical history of the region. * Researched the Natural History of the region. * Lentera International School Camp, Indonesia. Taken thousands of people into the wilderness during 6 Years of Tour Guiding in Kakadu National Park, Nitmiluk National Park (Katherine, N.T), Litchfield National Park N.T., Kimberleys W.A. For: Billy Can Tours, APT Tours, Kakadu Dreams, Goanna Eco Tours, Aussie Eco Tours N.T., Owner / Operator Sub-contractor in Tourism N.T. Reaching the Aims and Objectives that Meet Curriculum Standards. "To create a unique experience for the adventurer, nature and animal lover." "To evolve in such a way where human and animal connections are the core of our operation."